This is a list of military food topics. Military food topics include military rations, how military foods are prepared, distributed and utilized. A ship's biscuit (hardtack)—purportedly the oldest in the world—displayed at the maritime museum in Kronborg, Denmark. A Marine Corps-issued A-ration, colloquially known as a "bag nasty." This example contains two breakfast sandwiches, cereal, crackers with peanut butter and jam, a muffin, fresh fruit, and a drink. Garrison rations are foods that are served to military personnel when they are stationed at a location. This term is mostly used with respect to historic militaries. Field rations are a canned or pre-packaged meal, easily prepared and eaten, transported by military troops on the battlefield. They are designed for minimal preparation in the field, using canned, pre-cooked or freeze-dried foods, powdered beverage mixes and concentrated food bars, as well as for long shelf life. ↑ "Your Mobile Canteen in Action". Imperial War Museum. http://vads.ac.uk/large.php?uid=51297&sos=0. Retrieved 2014-02-11. 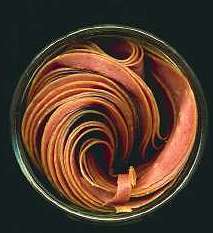 Wikimedia Commons has media related to Military food. Wikimedia Commons has media related to Combat ration.